We are all familiar with conventional lasers, where light is confined between two mirrors defining laser cavity modes and laser frequency. The light is trapped long enough for amplification by a gain medium (atomic vapor, solid, or dye) to be efficient. These lasers are in our CD and DVD ROMs and players, bar code readers, and the head stations that light up optical fiber. Recently, progress in nanotechnology has brought us laser paint as a robust and inexpensive source of coherent light. These random lasers are representatives of nonlinear disordered optical media that are studied in the physics of disordered systems under non-equilibrium conditions. Laser paint consists of a random aggregate of nano-particles which scatter light and have gain or are embedded in a background medium with gain. In a variety called diffuse random lasers (DRL) the diffusive escape of light is so rapid that such lasers exhibit no isolated resonances in the absence of gain. DRLs are completely different animals from conventional lasers, and the standard laser theory explaining lasing in terms of Fabry-Pérot interferometers or etalons analogy cannot explain laser paint. Recently Hakan Türeci of the ETH in Zurich and his collaborators have developed a theory able to treat the DRL rigorously and provide results on the lasing spectra, internal fields, and output intensities. 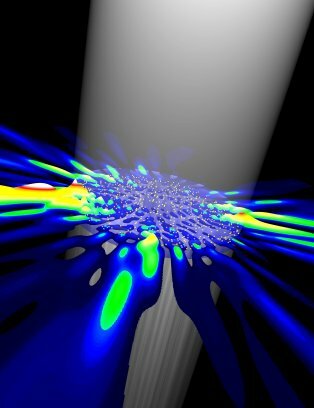 In essence, they have developed a unified picture of laser physics. By substituting the role of linear cavity resonances with a new set of modes, they found a simple analytical expression from which all of the properties of any laser structure can be derived, given a knowledge of the dielectric constant profile of the system together with the main parameters characterizing the amplifying material. Their work could spark a new branch of nonlinear dynamics in which phenomena such as optical bistability or multistability could be explored in novel types of lasing structures. Read more on their web site.